It's been a long time since the halcyon days of the kart racing genre. Mario Kart has been a long-time staple, but for a brief era every vaguely kid-friendly character had a kart racer. Mega Man: Battle & Chase, Sonic Drift, and Diddy Kong Racing were just a few of the games that tried to challenge Mario Kart for dominance. Probably the most successful was the Crash Team Racing trilogy: Crash Team Racing, Crash Nitro Kart, and Crash Tag Team Racing. Now the series is getting a new lease of life with Crash Team Racing Nitro-Fueled, a remaster of the first game. After a few rounds with Crash Team Racing Nitro-Fueled, I can say it's largely the same game that occupies the hazy space in your childhood memories. The kart racing DNA is strong, with power slide boosting, weapon pick-ups, and weird, colorful tracks. If you're a veteran of the genre, you'll power slide right into CTR; I didn't fully get the timing of slide boosting until my demo was finished, but I'd like to think I didn't embarrass USG too much. And while the Nintendo Switch already plays host to the excellent Mario Kart 8 Deluxe, Crash Team Racing also spreads the love to Xbox One and PlayStation 4. Where the new Nitro-Fueled really excels, though, is the additional work Beenox has put into remastering and remaking all of the original tracks. Giant slimes hide in pipes. Massive gears turn in the background. And as you race through each course, if you pay attention you'll notice tiny stories playing out across each lap. "We spent a great deal of time finding the story of every track. In every track, we add a lot of life. Everywhere we could inject personality, that's one thing we did. Little details here and there to make every track unique," said Beenox creative director Thomas Wilson. Polar Pass was a simple ice track based around a massive glacier. 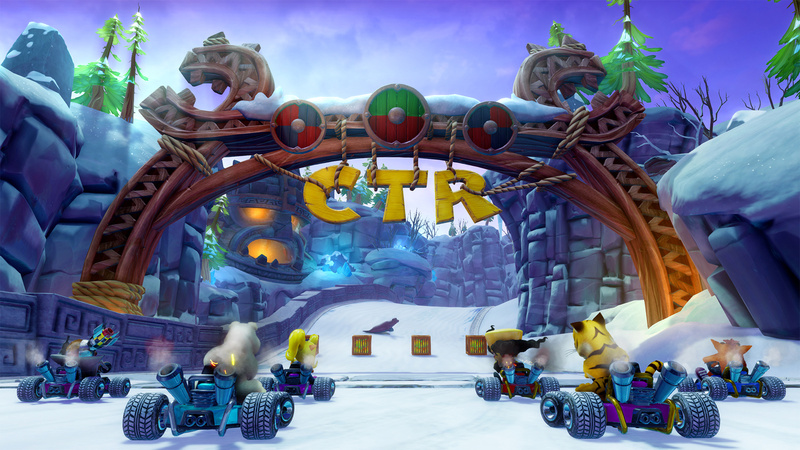 In Crash Team Racing Nitro-Fueled, it's now a fishing village for polar bears. Beenox has filled out the originally sparse background with huts, polar bear families, and campfires. There's even a rave going on, with a polar bear DJ and penguin dancers: as you pass by, the soundtrack for the course is remixed to be more dance-themed briefly. Clockwork Wumpa was previously a basic clock tower, but with Nitro-Fueled, it's now an entire wumpa juice factory. If you pay attention, you'll see barrels of wumpa juice being crushed with the clock tower's gears. Not only do you get all the Crash Team Racing courses, with whole new looks and remastered soundtracks, you also get redone courses from Crash Nitro Kart. And developer Beenox has put in the work to make every one shine. "The biggest challenge was for [Crash Nitro Kart]. We readapted the length of some of the tracks. A typical lap for [Crash Team Racing] could be 30-40 seconds, and some of the tracks on CNK were all the way to six minutes. We wanted to complement the original CTR material by readapting the CNK tracks a little bit more," said Wilson. 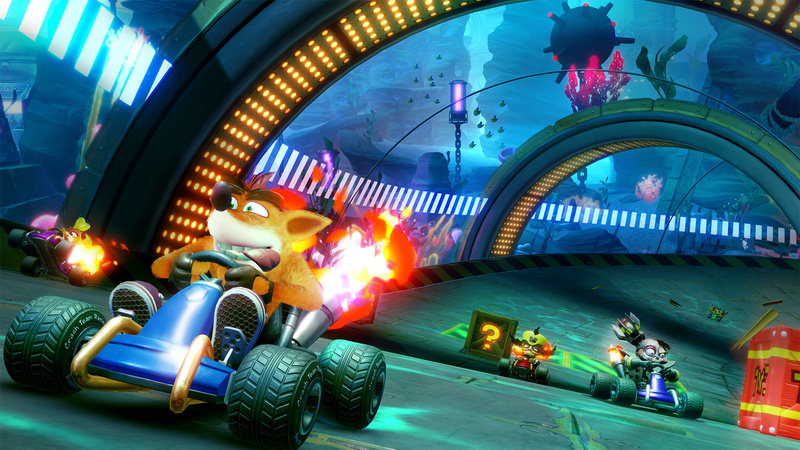 There's also a few new options to ease players into the Crash Team Racing experience. There's a new series of videos showing players how to power slide and use weapons. Beenox also added a new boost meter and Training Wheels, both of which are aimed at showing players the timing of power slide boosts. The meter fills as you slide, letting you know how big a boost you'll see when you hit the button. With boosting, the longer you waited, the larger you boost; the meter lets you see that visually, rather than guessing. Training Wheels add another visual signifier with your wheels heating up, to teach you the specific slide timing. "Authenticity was our first pillar. We wanted to make sure the driving experience felt the same. At the same time, [boosting] was quite a unique mechanic to learn. We looked at ways of teaching players how to master the technique. The Training Wheels, combined with the new HUD elements, will help players understand how that mechanic works. It definitely helps in understanding the timing," said Wilson. While I don't have the same familiarity with Crash Team Racing as some other kart racers, it's clear that Beenox is working hard to make the details of the game's world sing. "Animated" is the best way to put the remastered CTR, with so many little details I only noticed when looking over my recorded footage. Watch out though, as some of those details can trip you up, like the vicious venus fly traps that took me from 3rd to 8th in one race. Crash Team Racing Nitro-Fueled is coming to PlayStation 4, Nintendo Switch, and Xbox One on June 21, 2019 for $39.99. For more on Crash's kart racing journey, check out our Crash Team Racing Nitro-Fueled everything we know guide for more coverage. Tagged with Activision,	beenox,	Opinions,	PAX East 2019,	PlayStation 4,	Racing,	Switch,	Xbox One.